Family property, ideal for families with young children. 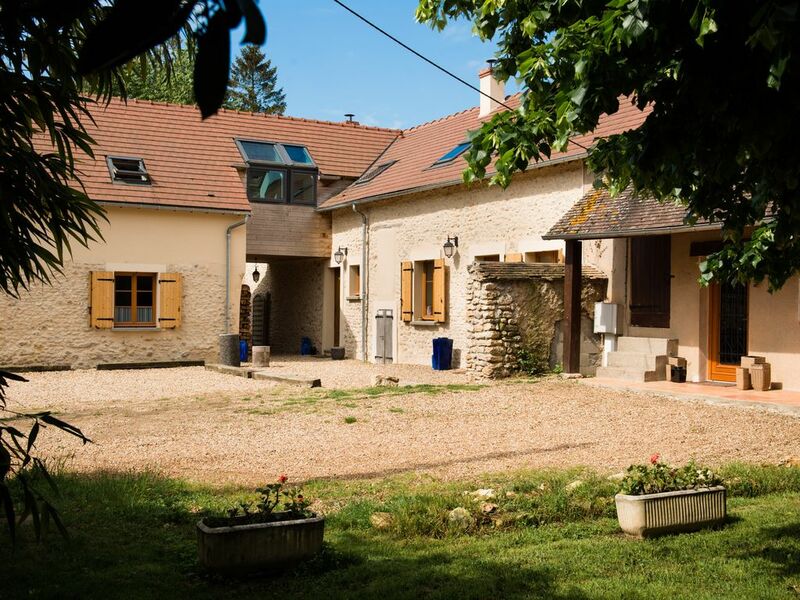 Pleasant and comfortable house, in quiet hamlet in the countryside of Beauce. An oasis of peace, space and light, for delightful moments around board games in one of the living rooms of the house, outdoor games, in the garden or water games in the covered pool (you can use it from May to October, not overlooked). Giant trampoline, swings, slide, ping-pong table and bikes are available. Small educational farm. 5 living rooms including 3 flat screen televisions and wood-burning stoves. 10 bedrooms with 5 double beds and 8 single beds, 2 sofa-beds, 1 baby cot. 4 equipped kitchens including 3 traditional ovens, 2 microwaves and 4 dishwashers. 5 bathrooms and 1 shower room, 4 washing machines and 1 tumble-dryer. 9 toilets in total. Perfect to spend some time with cousins, grandparents, children and grandchildren or friends with young children. During low and high season, we can adjust the number of guests according to the number of gites rented (option for up to 12, option for up to 8 and option for up to 4). Located only 1 h drive away from Paris and 20 min away from Chartres and its beautiful cathedral. Many activities and trips in the surrounding area. As part of a family carrying values such as nature and physical activites outdoors, we have had the chance during our week-ends and holidays to renovated this old abandonned farm thanks to the engineering skills of my father. Our family is also very international so that this warm and cosy place enabled us to organise family gathering in order to reunite all generations around special events. Therefore this place is full of shared joyful moments. I am still remembering our red cheeks after such an oxygen intake in the country as we were running after the ball in the huge garden all afternoon, the cherries picked in the trees, and the flowers basket from the woods around. We wanted to open this property to other families so that they could also rely on a peaceful and joyful place so close to Paris. We added some features espacially for kids such as little animals, and different games outside. Thanks to the rentals, we continue to improve the quality of the services each year. Every family unit is able to enjoy some privacy, while being able to come together in the biggest gite for meals or special moments. The various outdoor spaces enable everyone to take a breathe of fresh air, and for children to remain in a safe environnement. 5 bathrooms, 1 on the ground floor with shower, large washbasin, washing machine, efficient tumble-dryer and separate toilets. The others are upstairs including 1 with a toilet and bath. In the others, separate toilets. Also additionally, on one of the floors, there is a shower room with toilets. 2 bathrooms with hydro-massage shower and 2 washing machine/tumble dryer and 1 bathroom with bath, shower and washing machine/tumble dryer. Large washbasins in most of them. Hair-dryer at your disposal. Tiled floor. Electric towel warmer in 4 of the 5 bathrooms. Five bathrooms, one on the ground floor with a big shower, a big sink, a washing machine, a separate drying machine, and separate toilets. On first floor a bathroom with a bath and toilets. The others have separated toilets. Other washing/drying machine available. Hair dryer available. The kitchen in Gîte 1 can welcome about 20 people for meals. It has an area where meals can stay warm. The main dishes can be prepared in the kitchen of Gîte 2. 2 minutes drive, in the village near by. As an option. 1 Gas, 1 vitroceramic and 2 induction cookers. The 3 most modern ones have lit extractor hoods. 3 traditional ovens, 2 microwaves, 4 refrigerators and freezers, 4 modern and easy to use dishwashers, several living rooms to have your meals and a large oak communal table in the kitchen that leads to the pool. 3 flat screen televisions in the recently renovated living rooms and 3 wood burning stoves if you prefer to watch the fire crackle... Added to the fireplace in the main kitchen. Wi-Fi or cable Internet in 3 of the 4 gites. Large 1 200 sq.m garden. Ping-pong table, swings, small toboggan, giant trampoline, small farm with hens, rabbits, guinea pig, pheasants, partridge and 1 goat. 8 bikes of different sizes. Hot pool from May to October. Non smoking. This property is made up of three gites that acommodated 17 of us (4 families and grandmother). We never felt over crowded and the space available is so huge that I often had to hunt for family members. Two of the gites have new and modern interiors. These were great. The biggest gite is described as rustic, but desperately needs some TLC. People from this side of the property preferred to use the shower in the newer gite next door as it was far more inviting. I would recommend this property due to its sheer size being able to accommodate such a large group, as long as people are aware that one section is much older and does let down the rest of the property. Oh, and Disney is 1h30 away! It is true that the property is so big that there are still a few points which deserves to be renovated, but the reasonable price quoted enables many people to enjoy this place... It does not however allow us to renovate all at once. However, many improvement are implemented every year and indeed the one bathroom downstairs is next on the list (out of 4 bathrooms at disposal). Obviously, the houses which are brand new from 4 years ago are much more moddern that the traditionnal farm... All our other clients have underlined how clean the place is, and I feel that the appreciation here above regarding TLC is quite exagerate. Nevertheless, we welcome every comment and we will continue to improve our services. I appreciate that the grade given was still 4 out of 5, so I assume that our efforts were still much appreciated. Séjour entre amis, très apprécié. les gites sont séparés mais on peut se retrouver tous ensemble. ils sont tous bien équipés de la vaisselle jusqu'au loisirs ( piscine, trampoline, vélos...). Les propriétaires sont charmants et particulièrement serviables. Location que je recommande, d'ailleurs nous reviendrons ! Nous sommes très motivés par les retours de clients qui savent apprécier nos efforts d'embellissement et d'enrichissement du lieu... A venir de nouveau jeux collectifs pour les extérieurs de type "Puissance 4 géant". Merci de votre visite. PARFAIT POUR DES RETROUVAILLES ! Gites conformes à nos attentes, les différents espaces extérieurs et leurs équipements ainsi que la piscine couverte a donné satisfaction à l'ensemble de la famille qui s'est retrouvée lors de retrouvailles. Espace intérieur agréable et vaste, aux accessoires en quantité pour plus de quinze personnes. Un accueil très chaleureux et un gîte très agréable où tout le monde a son espace. Les enfants ont profité très largement des jeux extérieurs (vélos, table de ping-pong, trampoline et structure de jeux) vraiment idéal pour un séjour entre amis ou en famille. Le gîte est très bien équipé et ne manque de rien, nous le conseillons vivement!